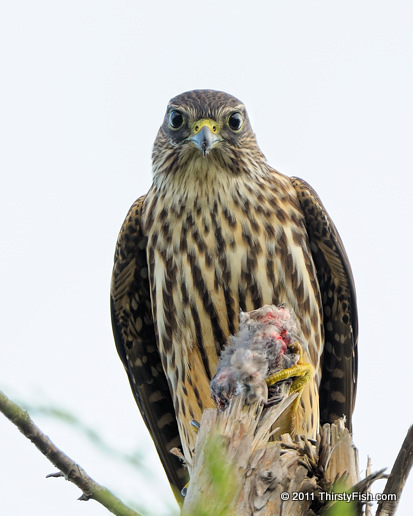 This is another photograph of the Merlin with a fresh kill, taken a few hours after the last photo. "I Find Your Lack Of Faith Disturbing", is uttered by Darth Vader in reaction to a commander questioning his belief in the force. It is from a scene in the original Star Wars film (Episode IV, A New Hope). Metaphoric Living: Most of us suffer from the hero syndrome. Many of us keep it in check by partially repressing and redirecting it to the sports that we play, the stories we write, the degrees we earn... When we "die" in a video game, we do not really die. When we win, we do not really win. We hide in our world of metaphors. Sometimes, life does not challenge us enough for us to come out of hiding. And when it does, we often find ourselves disconnected and unable to react. A hero, by definition, is someone that is admired for his or her abilities and courage by others. If a person's achievements are not recognized, or they are not apparent, then that person never becomes a hero. Yet, there are many non-heroes who have profound impact on our lives that we are not aware of. Non-heroes exhibit immense courage in real-world challenges. They are not indifferent or apathetic. They are sapient. And most profoundly, they do not suffer from the hero syndrome.